If you suffer from seasonal allergies, like I do, then you know that the symptoms can really lay you low — especially when they can linger for weeks at a time. There are plenty of effective over the counter remedies, like antihistamines, cough suppressants and expectorants to help you get through the worst of it, but there are few factors to consider. Maybe you are someone who isn’t good with remembering to take your next dosage, or maybe you are conflicted about what you can take that won’t bring on unwanted side effects, such as drowsiness. Most importantly, you want to know that the ingredients in whatever remedies you choose to take are safe and as natural as possible. It’s a lot to deal with when all you want to do is feel well again. 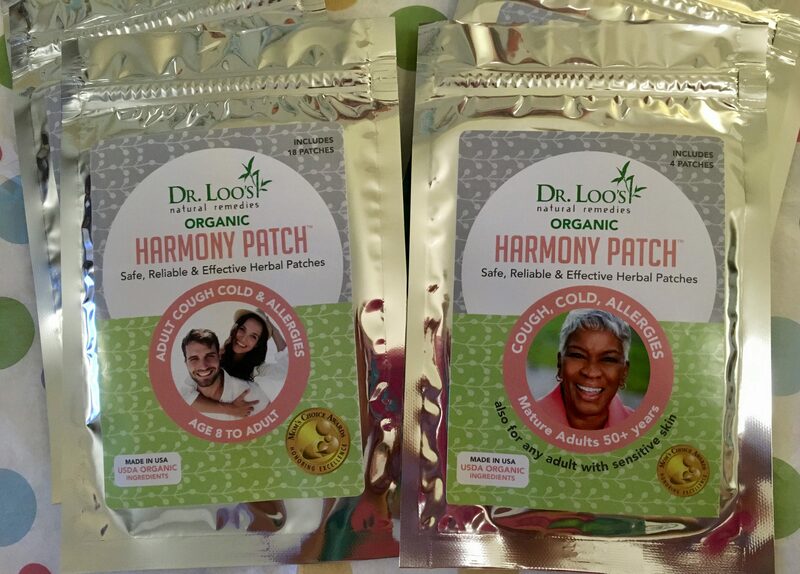 Coincidentally, a week into my most recent onset of allergy symptoms, I was contacted by a representative of Dr. Loo’s Harmony Patches, which are an organic, all-natural treatment for the relief of coughs, colds and allergy symptoms. She asked if I’d be interested in trying out Dr. Loos Harmony Patches as I blew my nose for the millionth time that day “I am having an allergy attack right now!” I replied. “How soon can you get them to me?” She put a package in the mail to me and I had them two days later! I started using them immediately. 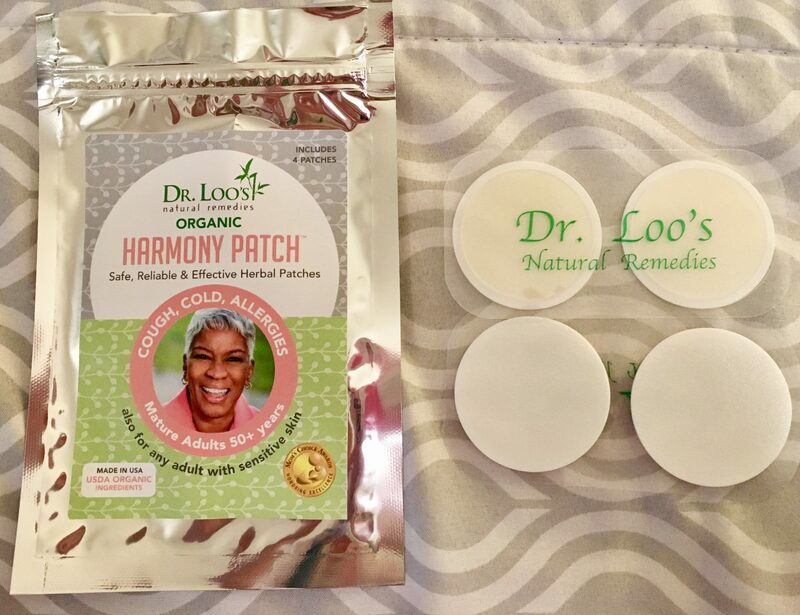 Dr. Loo’s Harmony Patches are transdermal patches containing herbs and organic, natural ingredients that you apply to your skin and leave on for up to 12 hours at a time. I received samples of two different varieties of cough, cold and allergy relief patches: one that treats Age 8 to Adult, and one for Mature Adults 50+ Years. For my first treatment, I applied five of the Age 8 to Adult patches as directed on the reverse of the packaging – 3 on my chest and 2 on my back – about an hour before bed time on a Friday, and slept with them on me. The patches seen above are about the thickness of a sheet of paper, and once they are on your skin, you do not feel them at all. Although I had been waking up several times during the night with coughing fits for, say, the previous five nights, on this night I didn’t cough even once during my sleep. Once I was awake on Saturday morning and hit the twelve hour mark, I removed the patches, showered, and applied a fresh round of patches to my clean, dry skin. I wore those patches from noon until midnight. I only coughed a few times throughout the day; and when I did, the cough was much more productive than it had been. I felt much improved from the previous 24 hour,s to say the least. Bonus: I didn’t have to remember to take any pills or other oral medications! Saturday night, I slept without any of the Dr. Loo’s Harmony Patches on me, but Sunday I decided to try the Mature Adult patches. These patches, seen in the photo directly above, are slightly thicker than the pink patches, and are therefore easier to apply, especially to your back area. Besides the visual difference in the color, shape and thickness of the patches, there is a difference in the adhesive, in that the Age 8 to Adult variety contains a small amount of acrylic, and the Mature Adult variety is recommend for anyone with sensitive skin. The propriety formula on both patches is identical, with the active ingredients being USDA organic ginger, chamomile, and fennel, with no alcohol sugar, bicarbonate or additives. Because Harmony Patches are applied directly onto the areas of the body where symptoms originate, the ingredients are absorbed into your body immediately and can get to work right away to make you feel better. After using the patches for a few days my symptoms were great reduced and I was much more comfortable. I recommend them! 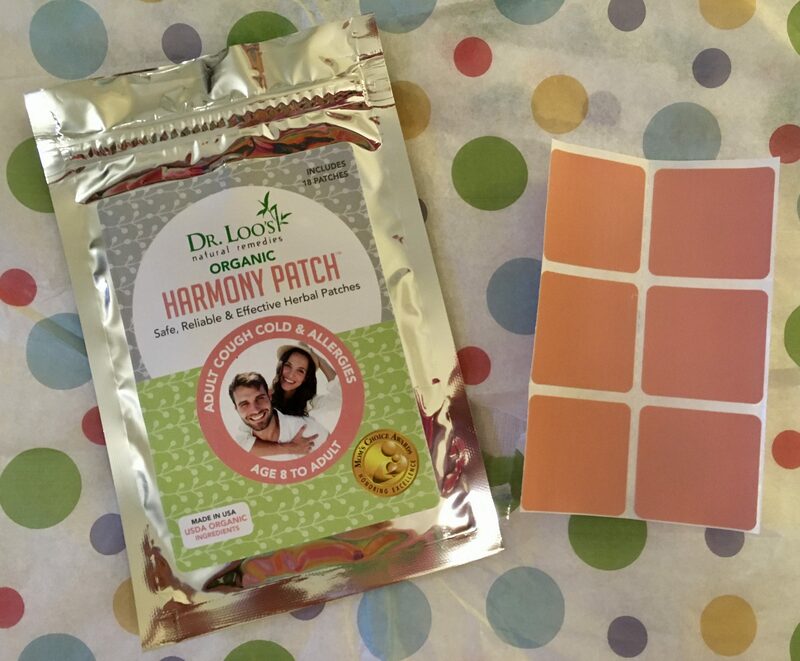 Dr. Loo’s Harmony Patches are also available to treat Tummy / Digestive Distress in both Children and Adults. 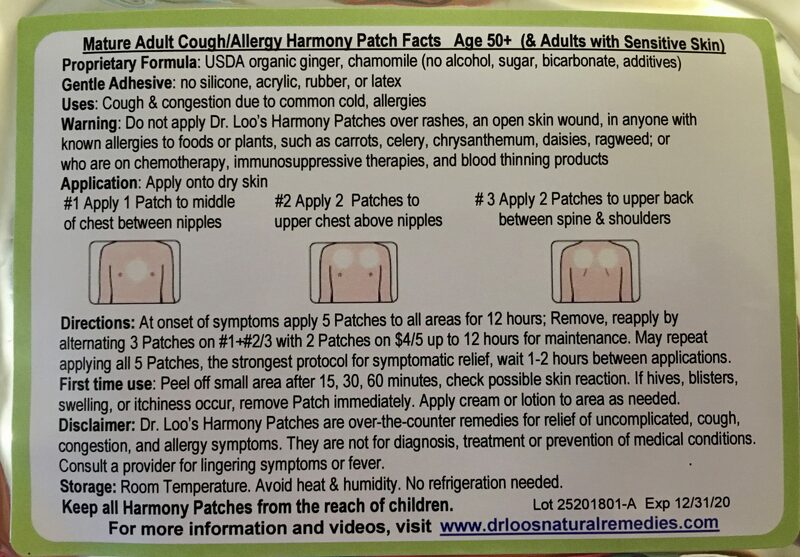 Get more information about the Dr. Loo’s family of Harmony Patch products at This Link, and visit Amazon Dot Com to Purchase!